Charles Bend was one of five men named on the Bottesford War Memorial who served with the Canadian Expeditionary Force (CEF) during WW1 – Charles Pacey, Arthur Gilding, Frank Raithby, Robert Turlington Noble Page. All five emigrated to Canada in the early 1900s. None survived. Born in Bottesford in 1891, the son of Mary and Rueben Bend, Charles, with his brother George, emigrated on the SS Corsican out of Liverpool on 5th March 1911. They caught the train to Liverpool from Bottesford Station and then onwards to Canada. Both of the brothers took up farming occupations in Saskatchewan. 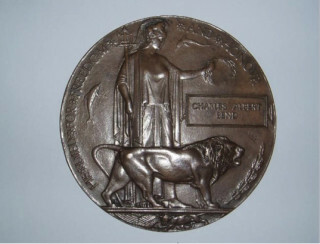 However, Charles volunteered in the scramble for enlistment in Edmonton, Alberta on the 20th August, 1914, recruited to the 101st Edmonton Fusiliers. 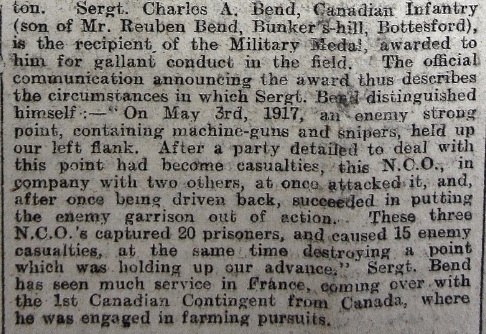 George did not enlist and remained in Canada for the rest of his life. Charles was transferred to the newly established base training camp at Valcartier in Quebec where 32,000 troops were assembled in six weeks ready for embarkation to England on 3rd October 1914. The convoy of seven warships and 32 transports docked in Plymouth on the 14th October, 1914. Unfortunately, they were then stationed at an ill-equipped training camp on Salisbury Plain in less than ideal conditions. Initially under canvas, in one of the wettest winters for decades, men succumbed to hypothermia and illness. It took until the 1st January to provide accommodation in huts. Upbeat newspaper reports and photographs made light of grim conditions and illness. On the 28th December 1914, The London Times included a report about the training of Canadian troops on Salisbury Plain. At that date Charles was still living under canvas. Charles remained at the Salisbury Plain training camp until his transfer to Shornecliffe Camp near Folkestone on the 3rd April 1915. He was posted as a reinforcement to the 1st Battalion’s Base Company. The 1st Battalion had already been in France since early February and by the end of April it had suffered extensive losses at the Battle of Grafenstafel, Ypres. Between the 22nd to 23rd April 56 men were killed, 306 wounded and 34 were missing. 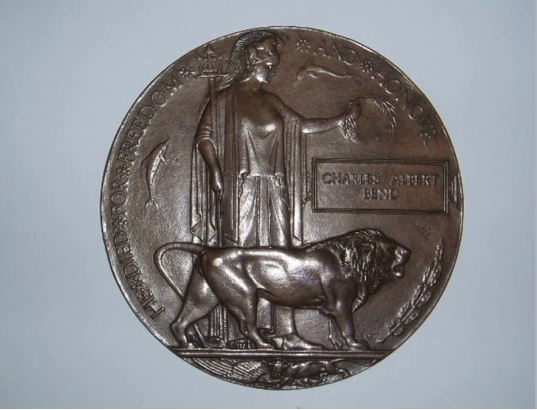 Charles was posted to France on the 26th April. He joined his Battalion and fought with them in numerous actions including at: Festubert (May 1915); Mount Sorrel (June 1916); The Somme at Courcelette (September 1916); Vimy Ridge (April 1917); Fresnoy (May 3-8, 1917) where he received the Military Medal in recognition of his initiative and courage; and finally at Passchendaele. 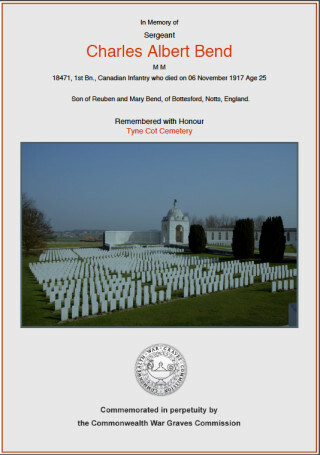 There at the age of 25 years old, he was killed in the final stages of the 3rd Battle of Ypres on the 6th November 1917. 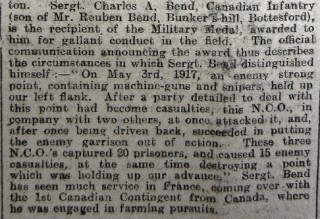 In his three years with the Canadian Infantry Charles Bend distinguished himself and was rapidly promoted in the field to a Corporal (14/5/1916), then Lance Sergeant (21/7/16), and finally to Sergeant (17/9/16). He also worked on ‘classified and non-classified ‘OB’ (Orders of Battle) at CBD’ (Canadian Base Depot) between 16th December 1916 to the 22nd February 1917. His was also decorated for bravery. The citation for his Military Medal, for ‘gallantry in the field’, illustrated his capacity to seize the initiative under adverse conditions. The Grantham Journal for Saturday 2t7th October 1917 reported full details of his gallantry. On May 3rd, 1917, an enemy strong point, containing machine-guns and snipers, held up our flank. After a party detailed to deal with this point had become casualties, this N.C.O., in company with two others, at once attacked it, and after once being driven back, succeeded in putting the enemy garrison out of action. These three N.C.O.’s captured 20 prisoners, and caused 15 enemy casualties, at the same time destroying a point which was holding up our advance. (A)ll ranks severely shaken up owing to severe shelling during the last 15 hours. The next day, in order to escape further Intense shell fire, companies in the front firing line moved forward 100 yards to take cover in shell holes. Sniper fire and the continued shelling caused further casualties. Finally, at 10.00 pm, after over 40 hours of intense action, the Gloucesters arrived to relieve them. It took until 2.00am on the 5th May to withdraw from the front line. Both the Canadians and the Germans suffered heavy losses including 1259 Canadians, almost all of whom were from the 1st and 6th Infantry Brigades. 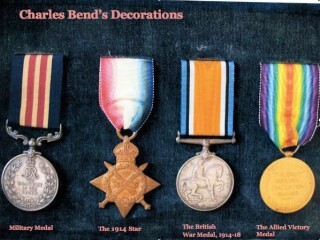 Throughout all Charles Bend’s front line action he received no serious injury. 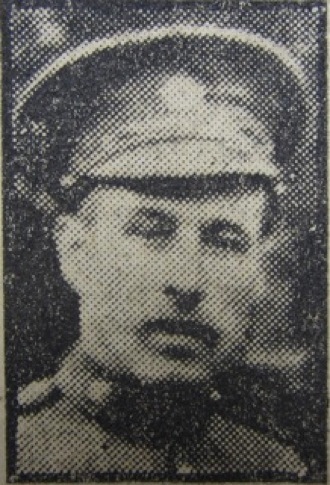 His record lists a week in hospital with ‘ICT’ (inflammation of the connective tissue) after the Battalion’s engagement on the Somme in the autumn of 1916. This was most likely some form of sprained joint such as the knee or ankle. 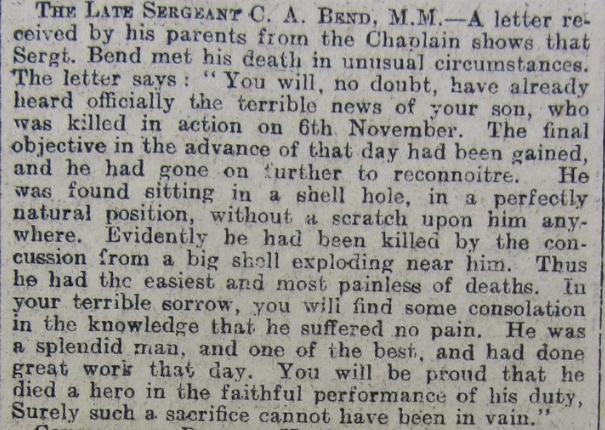 Ten days home leave in mid August took him from his Battalion during a period of training and relative calm. He rejoined them near Lens as it entered a period of intensive training in the 3rd Battle of Ypres. For most of October Charles was at a ‘Course’ at the ‘Canadian Corp School’. He returned on the 28th October in time to rejoin his Battalion for their action in the final week of the Battle of Passchendaele. The 1st Battalion entered the battle on the 5th November and the next day led the attack in their sector. On the morning of the 6th November 1917 at 6.30 am 548 men of the 1st Battalion, CEF went into action. By 7.45 am they had achieved their final objectives and made contact with the Battalions on their right and left flanks. They then prepared to consolidate their position. Apparently as the Battalion took steps to dig in their positions were ‘severely bombarded’ from 11.00 am to 2.50 pm. It is more than likely that Charles was killed by one of those high explosive shells. 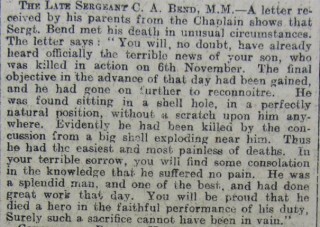 The Battalion Chaplain wrote to Charles Bend’s parents giving graphic details of the circumstances of his death. Of the 548 officers and men who went into action on the 6th November only 257 survived to be relieved on the 7/8th November. Charles Albert Bend’s grave is in the Tyne Cot Cemetery with over 11,000 others who lost their lives in the Battles of Ypres. We are most grateful to David Bend for sharing his research and family memorabilia. Remembered on the Bottesford Methodist Chapel Roll of Honour and the Bottesford War Memorial, St Mary's Church.